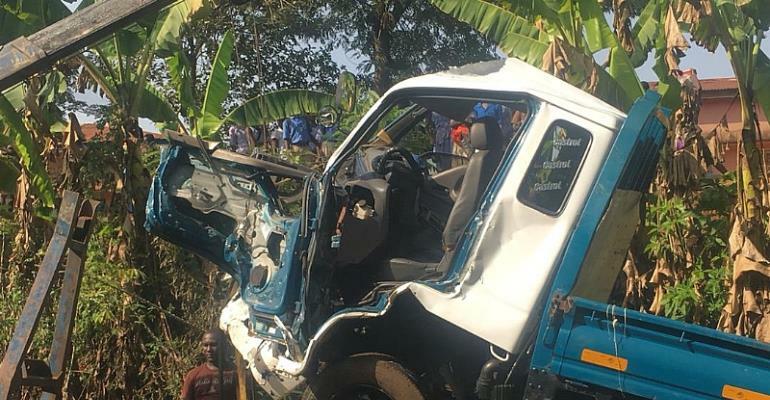 One person is reported dead while three others sustained various degrees of injury at a gory accident that occurred at a place popularly known as ‘Manso footbridge’ on the Oda-Manso road. The police said, the accident which occurred Tuesday afternoon at about 2:00pm when the driver of a Kia-Bongo truck with registration number GE 683-19 transporting foodstuff from Akroso to Oda lost control of the steering wheel after hitting a huge pothole. This made the driver lose control of the vehicle and smashed into a tree before running into a ditch killing the 52-year-old woman. An eyewitness account indicated that the Kia truck was on high speed before losing control of the steering wheel after hitting the pothole. The driver of the vehicle is among two other persons who were injured. They are currently receiving treatment at the same Oda Government Hospital.